All four of these appliances are known to be used to store and chill wines with varying degrees of success. If you’re in the least bit serious about your wines though you will already know that a traditional refrigerator is NOT a good way to store your wines, especially if you want to chill them to their ideal drinking temperatures. A normal fridge is simply too cold for wine. Nevertheless, a discussion differentiating a traditional refrigerator from a wine refrigerator is in order, serving to further emphasize just why you should never store your wines in your regular fridge. Refrigerators should definitely be lauded for doing their job well, which is to keep a wide variety of your perishable foods and drinks cool enough to slow down the process of aging. What refrigerators are NOT good at though is storing wine. Wine requires a special temperature range to thrive and remain intact, with the 40 degrees Fahrenheit average in normal refrigerators being a little too cold for both red and white wines, but especially reds. 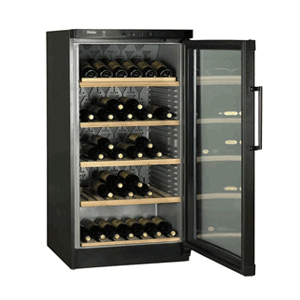 Wine fridges, on the other hand, are specifically designed with a temperature range that is ideally suited to the storage of wines. With regards to the vibration, normal refrigerators have a sole purpose of cooling their contents down and so no attention is given to minimizing vibrations — vibrations which are not too wine-friendly. A wine fridge, on the other hand, is designed to minimize potentially wine-spoiling vibrations that mess with the wine’s maturation process. The same goes for humidity — albeit the other way around. A traditional fridge basically does away with humidity during the cooling process, whereas a wine fridge maintains the level of humidity required to form a natural part of the wine’s maturation process. If you’re particularly storing corked wines you’ll have some idea of the fact that the cork does its wine storage and maturation job bests if it has a natural amount of moisture in it — moisture which would otherwise be eliminated in a traditional refrigerator. Other considerations incorporate factors like filtration of internal air to eliminate odors which could potentially contaminate the integrity of your wines. 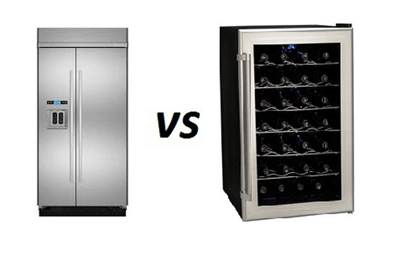 So now that you have no doubt in your mind that a fridge isn’t good at all for your wines, we can explore the differences between a wine refrigerator, a wine cooler, and a wine cellar (electronic), with the view of picking out the best option for you. Now if we weren’t allowed to elaborate and were asked which one you should choose between a wine cooler, a wine refrigerator, and an electronic wine cellar, we’d push you towards a wine refrigerator. Fortunately, though WineCoolery is here to give wine enthusiasts the most detailed and useful information with the view of helping you make the most out of your wine-loving exploits, so some detail is in order. While reading through various wine cooler reviews you will notice that wine refrigerators are generally more expensive than most wine coolers. This is because wine fridges are generally more powerful than wine coolers, making use of compression-based cooling technology. This means that a wine fridge has a bigger impact on the environment, but also that it reaches the temperature you set it to much faster AND it also maintains that temperature with great accuracy. You might have to put up with a little more noise, though. Depending on the size and capacity of a wine cooler, it generally makes use of thermoelectric cooling technology, although some bigger wine coolers are similar to wine refrigerators in that they make use of compression-based technology. 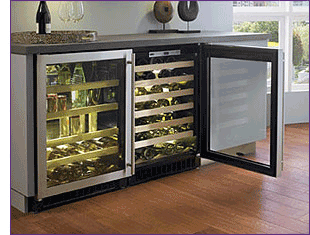 Wine coolers tend to be more portable than wine refrigerators though and so are more versatile in both their designs and their application (under counter, countertop, and freestanding). Finally, electronic wine cellars are often referred to interchangeably with wine coolers, just as wine coolers are often interchangeably referred to as wine refrigerators. An electronic wine cellar in the true sense of the phrase is what it says on the bottle — a wine cellar that is operated electronically. Think of a traditional, built-in wine cellar that you’d normally have in your basement and then just imagine that all its functions were electrified. You get a wine cooler that is built to last longer and one which is primarily built to store some vintage and collectible wines, which means the temperature it can reach internally is not affected by the outside air temperature, as long as it’s placed in the ideal wine storage spot. So, in a nutshell, your choice between a wine refrigerator and a wine cooler (sometimes referred to as a wine cellar) ultimately comes right back down to your wine storage needs. 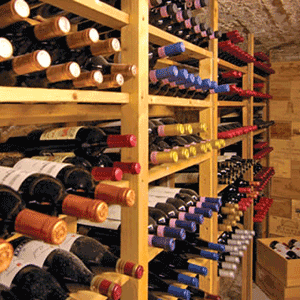 If you have vintages and collectibles to store, a wine cellar (electronic wine cooler) is in order. 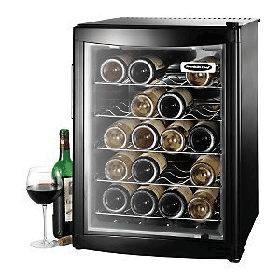 If you have delicate wines, some of which you regularly consume, a wine refrigerator will serve you best. If you have a variety of wines to store and to keep optimally chilled for quick and easy decanting, a wine cooler will serve you best. This isn’t a be-all and end-all selection criteria however, because a lot more factors need to be considered when choosing a wine cooling appliance, such as your budget, how many bottles you want to store, how portable you want the unit to be and how wildly temperatures fluctuate in your area or wherever you want to keep your wines.